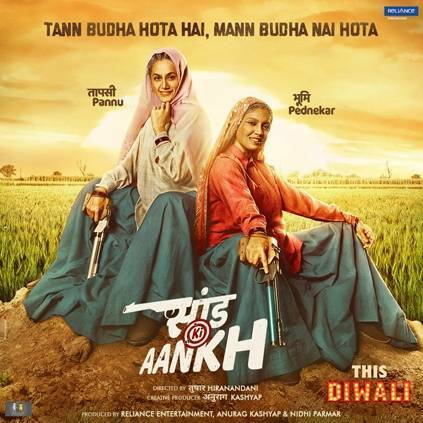 Saand Ki Aankh is an upcoming film that has Taapsee Pannu and Bhumi Pednekar in the lead roles, while Vicky Kadhan and Prakash Jha in crucial supporting roles. It is directed by Tushar Hiranandini, and produced jointly by Anurag Kashyap, Reliance Entertainment, and Nidhi Parmar. The makers of the film have released the first look poster, that has Taapsee and Bhumi Pednekar as 60-year old women. They have their guns pointed at the camera, and it does look interesting. The film is a biopic of the oldest sharpshooters in our country, Chandro Tomar and Prakashi Tomar. It must be noted that Taapsee trained in pistol and air-rifle shooting for this film. The poster has also revealed that the film will be releasing for Diwali 2019. The filming began around mid-February, and is expected to get wrapped up soon. Taapsee Pannu has been on a roll with films like Manmarziyaan and Badla doing extremely well at the box office. Catch the first look poster attached. Stay tuned for more updates. People looking for online information on Bhumi Pednekar, Saand Ki Aankh, Taapsee Pannu will find this news story useful.